Now that you have decided to get married, you could be confused choosing between a destination wedding and getting married in the traditional way. However, a destination wedding can be a much better option considering the fact that a destination such as the Cayman Islands are a dream location for destination weddings. Therefore, if you are worried about not be able to handle your wedding in the traditional manner, then a destination wedding in the Cayman Islands can be just what you aspired. The Cayman Islands, located in the Western Caribbean, are a trio of islands namely Grand Cayman, Cayman Brac, and Little Cayman. These islands are very popular not only for their great location but also for their high level of professionalism when it comes to destination weddings and Cayman beach weddings. n the Cayman Islands, it is highly recommended that you select a wedding planner for your wedding so that the days before your wedding are less stressful. Many destination-wedding companies here offer wedding planning services that include the entire gamut of wedding planning. The best helping hands can make things easier for you in the run-up to your wedding day. Perhaps this is why many people prefer the Cayman Islands for beach weddings than any other destination in the Caribbean. The Cayman Islands are blessed with numerous destinations in the form of beautiful beaches, historic sites, parks and gardens, and even restaurants and resorts where you can hold your wedding with the help and assistance of your wedding planner. Cayman Beach weddings are renowned world over. A romantic option is Seven Mile beach weddings, as the beaches here are famed for their white sands throughout the world. Other picturesque locations for islands beach weddings can be Smith Cove Beach, Spotts Beach, Rum Point Beach, South Sound Beach, and West Bay Beach. Since Grand Cayman is the culinary capital of the Caribbean, choosing the right catering for your wedding occasion here is a breeze! You can order the best of food and fare in the Cayman Islands besides ordering for cookies and custom designed cakes. The choices are endless so you might need to do a little bit of research before you choose the right caterer for your wedding. Your wedding planner would usually have a few recommendations for catering or even better they might have some tie ups with catering companies. Make sure to ask them before trying to find someone on your own. Today, beach destination weddings in Cayman are here to stay and have become an extremely popular trend. 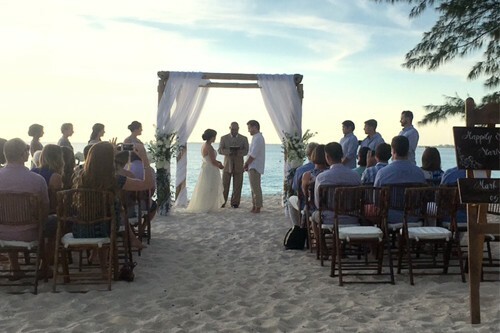 Couples from all over the world are journeying to the Cayman Islands to get married. Each year, the islands are witness to more than 600 weddings. A destination wedding packs more excitement than just a traditional wedding as the former allows for a lot of convenience and many picturesque moments. The sound of the soothing waves on the seashore while you two hold hands together can encompass a moment that you will never forget. Let the preparations for your big day begin!